As soon as I decided to start this project I realized I didn't own any graph paper! I turned to my good friend Google for the solution. I searched for free graph paper and ended up on this website. I chose engineering graph paper, 8.5 x 11 size, and 1/4" boxes. I printed off three sheets, but ended up only needing to use two of them. I also made sure to grab pencils, pens, and a calculator! Our floor plan was available to see online on our apartments website, if your room dimensions aren't so readily available there might be an additional step here to measure your rooms. 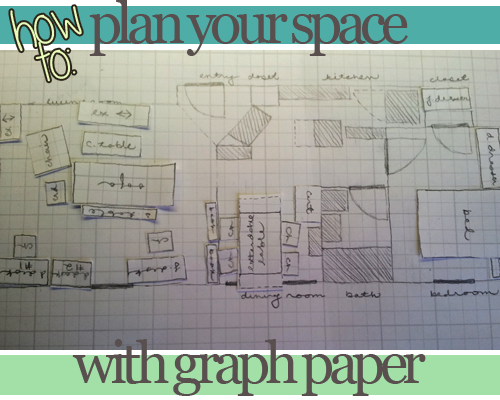 Once you have the measurements of the space you want to plan you'll need to decide how much space one box on the graph paper will equal in real life. I chose to make each box be equivalent to 1ft x 1ft square. If you have a larger space or smaller space than mine you might need to adjust this. Draw out your walls and rooms first, then add windows and doors. Make sure you note on your plan which way the doors open, so you don't accidentally put anything in the way! I also chose to draw in the permanent fixture now like the fridge, oven, shower/bath, sinks, and built in cabinets. These items are shaded in grey on my plan. 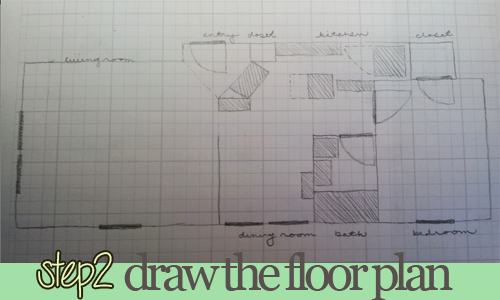 This is probably the most tedious step in planning a space, but trust me it is so so so worth it! I looked up the measurements online for most of the furniture I already own (because most of my furniture is from Ikea!). I also had to estimate the measurements of a few of John's things that I didn't know the size of. I wrote down each big item's measurements in a notebook first, then drew each piece of furniture on another piece of graph paper. 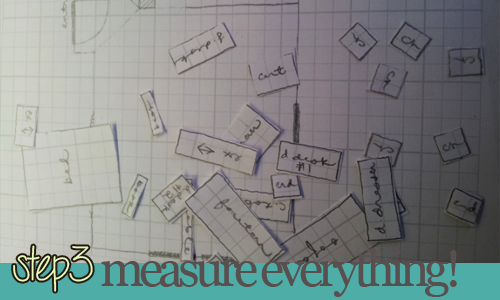 After you have the measurements written down drawing them out on the graph paper only takes a couple minutes, then cut them out. This picture shows the jumble of furniture I was going to attempt to squeeze into our little apartment! Here's the fun part! 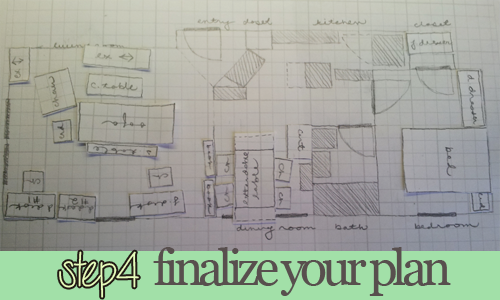 You have your floor plan, and your furniture cut out, time to find a place for everything. The dining room area was the easiest for me to plan, it's tiny and I only needed to fit a table and a rolling kitchen cart in. The living room was a different story I tried so many different arrangements my head started to spin! I think I've finally decided on the one pictured above, but we'll have to see when I start moving the furniture into the room. After getting everything laid out I glued it down, now I have a set plan to look at when move in comes. It fees great to have a solid plan, and even though I might decide to move a few things around in the living room I know for sure that all the furniture I was planning on bringing will fit. This way I won't have to send things back to my parents' house three hours away! I'm also glad that I made the final decision to glue everything down, now I have a solid plan to carry with me on move in. Let me know how your space planning goes! What a wonderful idea. I love your dainty little handwriting, too!